I wake up at 4AM this morning, but manage to get back to sleep until 6:30AM. Setting the ship’s clocks forward almost daily is starting to catch up with me. I meet my friend in the Explorations Cafe for cappuccino and a snack at 7:30AM. I go to the Lido for some scrambled eggs and toast before walking the circuit on Promenade Deck a couple of times for a 1km distance. It is cool outside, so I zip up my fleece jacket, although the seas are much calmer and the wind isn’t a factor today. When I return to my cabin, I catch my cabin stewards and give them an envelope with some US$ for all their cheerful work keeping my cabin clean. Ginny Stibolt’s final talk: Public Gardens – Traditional public gardens are well-trimmed and orderly, but newer public gardens have emphasized native plants. When I visit New York City, I want to see Highline Park – a natural park on a elevated rail; and when I visit Chicago – Lurie Garden. My friends and I go to the Tamarind restaurant this evening, on Gala Night. We all have Martinis in the beautiful but quiet Tamarind bar before dinner, and then dig into the menu to select some items we didn’t try the first time we were here. I select an Austrian Riesling wine, which goes well with the seafood that dominated the menu. 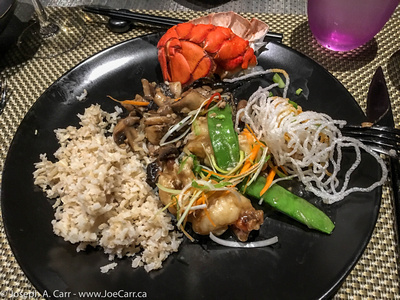 We have: spicy Thai Chicken and rice soup, Shrimp Tempura Indochine, Ginger and garlic wok-seared lobster with sake-braised oyster and shiitake mushrooms, brown rice, Java mint and coconut rice pudding, Mango Cloud – a light egg white soufflé mango sorbet. It was all excellent! I think the Tamarind is perhaps the best restaurant aboard the ship, although there is a modest premium charge to dine here.